1880 United States. Census Office. 10th census, 1880 federal population census, Washington, District of Columbia: National Archives and Records Service, ([19--]) , FHL Film 1254540; National Archives Film T9-0540; Page 315B. "Massachusetts Births, 1841-1915", database with images, FamilySearch (https://familysearch.org/ark:/61903/1:1:FXCP-QKM : 1 March 2016), Clara Sophia Fairbanks, 1857. "United States Census, 1870," database with images, FamilySearch (https://familysearch.org/ark:/61903/1:1:MD3X-S51 : 17 October 2014), Omar Fairbanks, Massachusetts, United States; citing p. 30, family 258, NARA microfilm publication M593 (Washington D.C.: National Archives and Records Administration, n.d.); FHL microfilm 552,125. "Massachusetts Births, 1841-1915", database with images, FamilySearch (https://familysearch.org/ark:/61903/1:1:FXD7-PNK : 1 March 2016), Cora E. Fairbank, 1882. "Massachusetts Deaths, 1841-1915," database with images, FamilySearch (https://familysearch.org/ark:/61903/1:1:NWMS-VMK : 10 December 2014), Cora E. Fairbank, 04 Aug 1882; citing Gardner, Massachusetts, v 339 p 384, State Archives, Boston; FHL microfilm 960,223. Lorenzo Sayles Fairbanks A.M., Genealogy of the Fairbanks Family in America, 1633-1897, , at https://books.google.com/books?id=rbJ3WLoOEo0C . Boston, MA: American Printing and Engraving Co., (1897) , p. 789. "Massachusetts Births, 1841-1915", database with images, FamilySearch (https://familysearch.org/ark:/61903/1:1:FX7L-YTN : 1 March 2016), Hattie Allen Fairbanks, 1880. Massachusetts Vital Records, 1841-1910, , Vol. 83, p. 181. 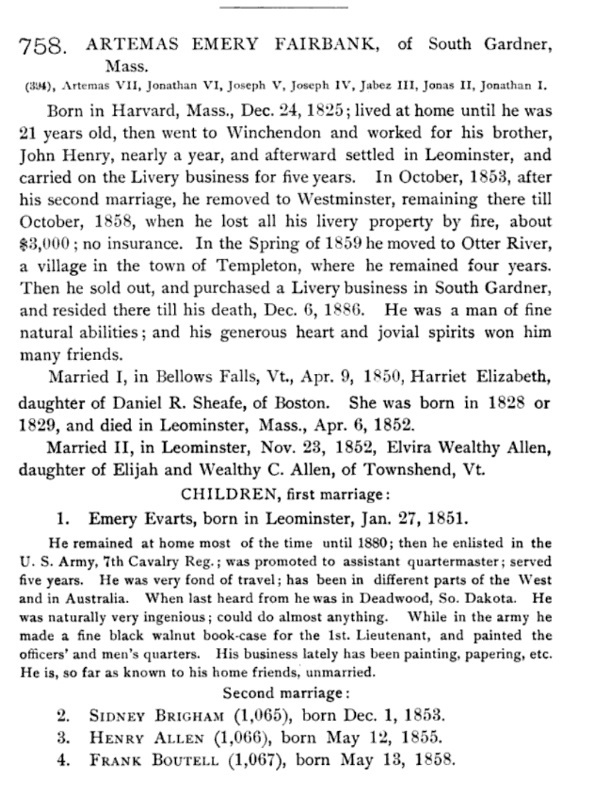 "Massachusetts Deaths, 1841-1915," database with images, FamilySearch (https://familysearch.org/ark:/61903/1:1:N7NR-64B : accessed 10 April 2016), Henry A. Fairbanks, 07 Apr 1854; citing Leominster, Massachusetts, v 86 p 139, State Archives, Boston; FHL microfilm 960,170. Lorenzo Sayles Fairbanks A.M., Genealogy of the Fairbanks Family in America, 1633-1897, , at https://books.google.com/books?id=rbJ3WLoOEo0C . Boston, MA: American Printing and Engraving Co., (1897) , p. 641. Lorenzo Sayles Fairbanks A.M., Genealogy of the Fairbanks Family in America, 1633-1897, , at https://books.google.com/books?id=rbJ3WLoOEo0C . Boston, MA: American Printing and Engraving Co., (1897) , p. 640. 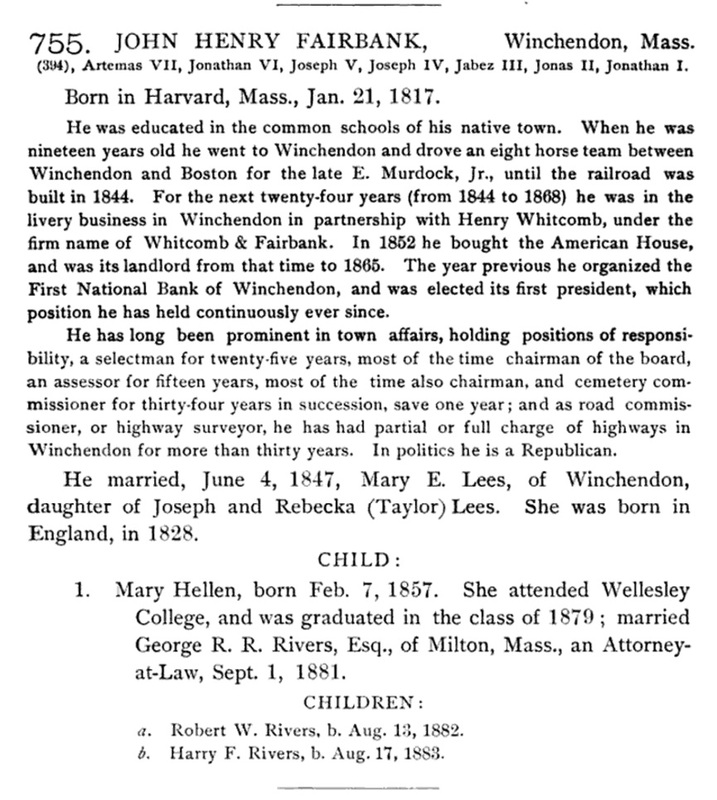 "Massachusetts Deaths, 1841-1915," database with images, FamilySearch (https://familysearch.org/ark:/61903/1:1:NWT7-Y3P : 10 December 2014), John Henry Fairbank, 08 May 1907; citing Winchendon,,Massachusetts, 499, State Archives, Boston; FHL microfilm 2,217,701. 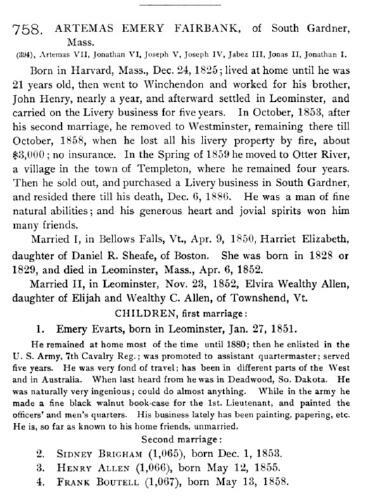 "Massachusetts Births, 1841-1915", database with images, FamilySearch (https://familysearch.org/ark:/61903/1:1:FX6Q-45D : 1 March 2016), Leonard Henry Fairbank, 1886. Omar Fairbank was a carpenter. 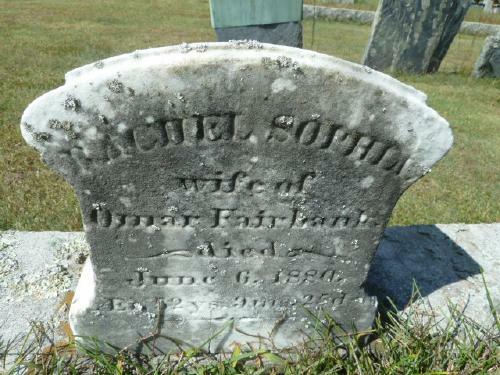 "Massachusetts Deaths, 1841-1915," database with images, FamilySearch (https://familysearch.org/ark:/61903/1:1:NWKK-YQP : 10 December 2014), Rachel Fairbank, 06 Jun 1880; citing Hudson, Massachusetts, v 320 p 91, State Archives, Boston; FHL microfilm 960,218. 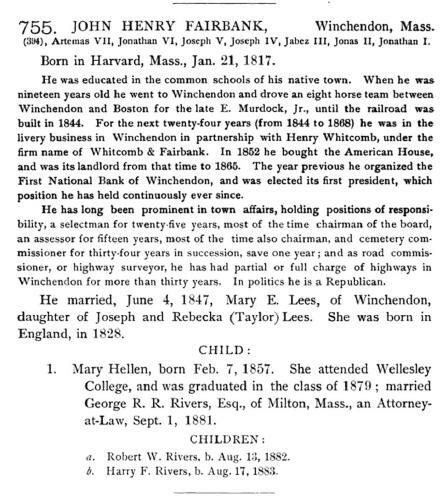 Massachusetts Vital Records, 1841-1910, , Vol: 287 ; Page: 111.